We continue to monitor the weather forecast. As at 3 pm on Thursday 31st January, we do not plan to close the school on Friday 1st February. Please make sure that your child comes to school dressed for a cold winter’s day. We recommend wellington boots or stout shoes as well as a warm coat to travel to and from school and for break and lunchtime. We will keep you informed of any changes. We are carefully monitoring the weather reports this week. Our aim is always to keep the school open whenever possible but the safety of pupils and staff is our priority. By email/text on the Scopay communications tool. On local Radio Stations (BBC Radio Solent and Wave 105 are the most reliable for this; other stations include Heart South Coast and The Breeze). If the situation arises that we have to close the school early in the day to ensure that children and staff can get home safely, we will let you know by email/text and also post it on the school website. If your work takes you far from home, please have a contingency plan for someone else to collect your child and advise the school of this arrangement should an early closure be needed. The delivery of our new building has been cancelled for Friday 1st February 2019. The company providing the building, Portakabin Refurbished Ltd, is based in Yorkshire. This is where the building has been fitted out ready for installation. Portakabin have made this decision based on the forecast of poor weather moving across the country overnight, and difficult weather conditions in the north and north west of England, which could make motorway transport of a modular building even more challenging than usual. Thank you for your help in planning for reduced traffic this Friday. We will communicate with Portakabin today to rearrange delivery. We will then let you know as soon as possible when we need to request from you, once again, your kind efforts to limit the number of cars coming onto the school site. 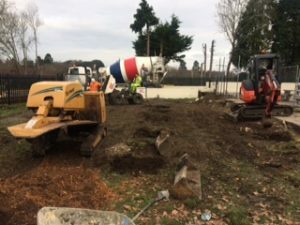 On Friday 1st February 2019 we will take delivery of our new building. This will involve a crane being on site all day, a series of articulated lorries accessing the site during the day, and a fleet of contractor vehicles arriving as well. All of this vehicle and plant traffic will take up a lot of our car parking space throughout the whole of Friday 1st February. 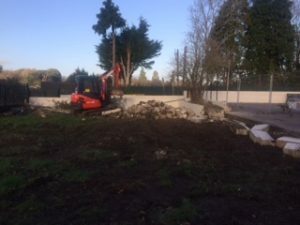 Because of this, with the exception of vehicles which have a St Peter’s pass for those drivers or pupils with limited mobility or additional needs, there will be no parking spaces on site for parents and carers to leave their cars and drop their children into the south playground in the morning. For children being dropped off for Breakfast Club or additional provision from 8:00am, car drivers are asked to use the one way route and drop-off walkway alongside the north playground. Extra staff will be on hand to welcome and direct the children into school. The one way route to the drop-off walkway that runs by the north playground will be opened 10 minutes earlier on that day, at 8:20am, to help ease a possible increase in vehicle use for that option. For that Friday only, additional staff will be on duty in the north playground to welcome any extra children who would normally wait in the south playground with parents or carers but who instead will be dropped off to the north playground. Any families that are able to car share and so reduce the number of cars coming into St Peter’s in the morning would be greatly appreciated. Families who would rather stay with their children on the south playground but normally do this by parking on site are asked to allow plenty of time to be able to park off-site and walk onto St Peter’s grounds. The timing for the south playground gate will remain between 8:30am and 8:50am as normal. St Peter’s staff have been asked to car share, use alternative means of transport, park off-site and even offer up their local driveways for colleagues in an effort to reduce the vehicle presence on site as much as possible during the building delivery day. Collection at 3:15pm will be as normal on foot for all families, with the exception of vehicles which have a St Peter’s pass for those drivers or pupils with limited mobility or additional need. Families collecting from after-school care at 3:45pm and 4:15pm, and Hip-Hop Club at 4:00pm will need to park off site and access an exit St Peter’s on foot. I know that these changes will have an impact on families’ travel arrangements for the day, but any possible inconvenience will be long forgotten when the pupils get to enjoy the additional space and facilities that the new building will provide from March 2019 onwards. Year 5 added to their school experience this week as class 5CW went to Waterlooville Horizon Leisure Centre to begin their swimming lessons. An objective of the National Curriculum is for children to be able to swim 25m by the time they finish the primary phase of their education, and St Peter’s commits to this with lessons for the pupils in the spring term of Year 5. Making use of trained swimming teachers at the leisure centre, each Year 5 class will have swimming lessons over several weeks to improve their techniques or hit a personal distance goal in the water. I know that swimming is a popular past time, and the pools in Waterlooville and Havant are very popular with our pupils after school, at weekends and during holiday times. It was great to note that when I was in the pool last weekend churning out the lengths during my own son’s lesson, I counted 10 other St Peter’s pupils in the water with families or attending lessons – not bad for 9:30am on a cold Saturday morning! Happy New Year for 2019 from everyone at St Peter’s Catholic Primary School. The new term has started at quite a pace, with everyone getting back into a hard working routine from the word go. Year 5 pupils have already taken the first outing of the year with a trip to the Science Centre in Winchester. This visit kicked of their spring term topic of Space, and was enjoyed by all the children. Thank you to the Year 5 staff and parent volunteers who made the trip possible. Sixth Form students from Oaklands delivered this Friday’s assembly to the whole school. As CAFOD representatives, the students helped out pupils to understand the plight of child migrants across the globe, and how through prayer and charity we can endeavour to improve the lives of those in greatest need. Miss Shaw launched an appeal for our own pupil body to select CAFOD representatives in St Peter’s to further the work we do for that charity. 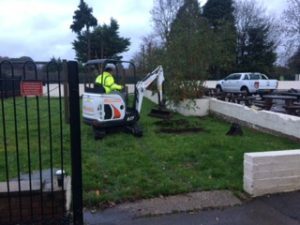 And finally, ground work has finally begun to prepare for the new building. The modular unit will provide an additional indoor open learning space for our pupils to use as well as the school hall, as well as having a small kitchen for pupil cooking and extra staff work space. We will keep you posted on progress!